Everybody's into DIY baby nursery ideas. The idea that you can "Do it Yourself" is popular because it's a way to get that stylish baby decor that you want for baby without spending a lot of money but it's not for everybody. Learning to do your own various decorative techniques is a way to personalize your home, but there are some areas that are best left to professionals. I'm often asked whether it will save money to make your own baby furniture. My answer to that question is that a skilled craftsman with lots of material and tools lying around probably could save lots of money. An amateur might waste more money than new stuff would cost and heaven forbid; lop off a finger. Unless you have plans for a lifetime hobby of carpentry, it would not be cost effective to buy equipment and supplies to decorate one bedroom. So, what's a frustrated "do it yourself-er" to do with their portolio of baby nursery ideas that they've been collecting? By all means, put your decorative touch to work and personalize your baby's bedroom to your heart's desire. Please be aware that some decorating projects for newborn babies are better suited for amateurs than others. I am going to be biased and say that this baby website is a wonderful resources for finding your own decorating style. There are also many wonderful magazines, books and catalogs that focus on trendy home interiors where a decorator can find inspiration. Choose a simple craft that will fit with your nursery decorating ideas. A nursery door wreath with some decorations that hint at the baby's theme and the fashionable nursery layout that you've designed will be an quick and easy craft that will be inexpensive, fun and yet will have a huge decorative impact. Painting is the least expensive way to put your personal touch on any room. If the walls are in good shape, stencil a cute design as a focal point. If you are an advanced painter, tackle a border or a small mural. 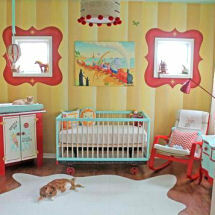 Murals are an excellent way to express yourself as well as to make a display of your creative baby nursery ideas.